Tattoo and I are home safely after an incredible journey. Tryon was my 4th WEG and no doubt the most demanding and rewarding one I have ridden in so far. Tattoo has been a complicated, emotional and challenging horse to train to Grand Prix. While he is extremely talented, he does not have a laid back personality. He can be unpredictable at times and can also give me some of the best feelings I have ever experienced on a horse. Going into the US Trust arena last Wednesday, I can honestly tell you I had no idea what would happen! On Tuesday, the day before my test and the last day of our familiarization in the main arena, Tattoo did not want to enter. He was scared and desperately preferred to stay with his friends back in the main warm up area. We worked through the in-gate together, going in and out with lots of sugar until he gained confidence to continue on around the ring. In addition, there were signs hung within the arena along the boards that said “World Equestrian Games”. He thought those were monsters from another world popping up inside his ring! I took my time and showed him they were in fact, just signs and not monsters and he did get better and better that day. The day of competition I was unsure if Tattoo would think the monsters might appear again, or if he could remember they were OK from the day before. It is always different on competition day, with the judges around the arena, crowds appearing in the stands and— the absolute hardest thing for Tattoo—no other horses in the ring with him. He loves his friends, and does not like being on his own! During each test leading up to the Games he would call out to his friends part way through. I tell him each and every ride “NO talking in class!” But usually he does not listen to me and screams away, lowering our walk mark. Just as I drop my reins for the walk work, I start saying “no talking Tattoo, no talking”…..5 seconds later he is screaming for his pals out there to come and be with him! Competition day arrived and I believe Tattoo and I rode one of the best Grand Prix tests we have ever done. I felt like he knew, 'this is WEG, this is it, this is where we want to shine.' And he did it, he trotted into the ring with confidence, he never looked at the signs in the ring, he focused on me the whole time and never talked in class. I am so proud of him! I feel like he did it for me, for my love for him, because of our bumpy road together, he gave me his all. I know we were far from a gold medal, but in my heart I won one that day. In our partnership with horses we face so many challenges, and I can tell you I had many days when I questioned the journey with Tattoo. But, we kept going and when I was at my lowest, Tattoo would somehow show me we should continue. I am so blessed to work with these magnificent animals daily, to understand them and train them to the best of my ability. 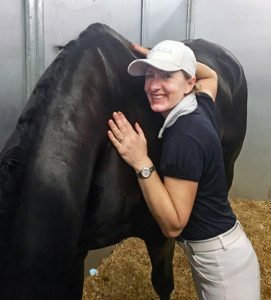 What Tattoo gave me at WEG was one of the biggest highlights I have experienced as a trainer and rider. My emotional, challenging horse gave me his very best. That is my gold medal. My family, my husband, parents and my kids have been with me through all the ups and downs. They give me love and support every day no matter what the outcome. My farm team includes Alexis Bradbury, Carl Callahan, Avery Clune and Lynsey Rowan. They take care of Tattoo and all the horses, whether at home or on the road. If I need to add, subtract or change things daily, they are there for me with the best positive attitude I could ever ask for! My wonderful vet, Dr Usha Knabe, keeps all the horses in their very best health and soundness. In addition, thank you to all my students and friends who kept pushing me along the way and supporting me. Your encouragement helps me each and every day. And my coach, Christilot Boylen ... I don’t know where to begin! 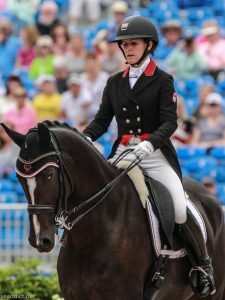 She is the most amazing horse woman in the world. Her wealth of knowledge is incredibly deep. She so clearly loves the horses and is constantly learning new things, finding fresh challenges to improve my performance and help me with my horses. She guided me through the training journey with Tattoo, and offered emotional support and advice when I needed it. She is there for me through the good and the bad. Christie, Thank you! Words are not enough! No least, Thank You, Tattoo. He has taught me so much, helped me grow as a person, and inspired me to keep believing. I am so grateful to have him in my life. Finally, my sponsors are each so special, Thank you all: #AlbertoFasciani , #HaywardSportswear, #OmegaAlpha, #ParamountSaddlery, #PiaffeShoppe, and #STAYONS. We deeply appreciate Team Canada and #AsmarEquestrian for their support!